“There are few things so pleasant as a picnic eaten in perfect comfort,” or so said Somerset Maugham, and who could argue with that? 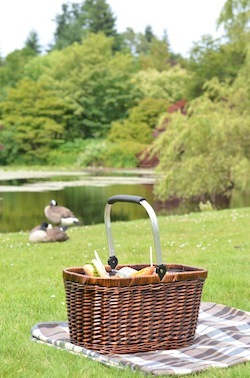 There is nothing more perfect than a picnic on a summer’s day. $2.00 from every picnic sold will be donated to Karma Exchange, a registered non-profit charity that helps girls in northern Ghana access education. Picnics are packed on a first-come basis and cannot be ordered in advance (in person only orders at Truffles). FYI – peak hours are from 11:45 a.m. – 1:15 p.m. Try to come a little early or a little later to avoid the crowds. Whether you choose the Monet picture-perfect Meadow Garden complete with stream, or the tranquility of the Great Lawn or the ‘hidden bench’ along fragrant Azalea Path; we know that it won’t take long for you to become addicted to this special form of urban-stress buster. http://www.facebook.com/> for daily updates on the Garden or visit the Garden’s web site www.vandusengarden.org . For further information on Truffles visit its web site:www.trufflesfinefoods.com/café .